"Not your typical macaroni and cheese meal. Comfort food! A great dish to make using the leftover ham from a previous meal. 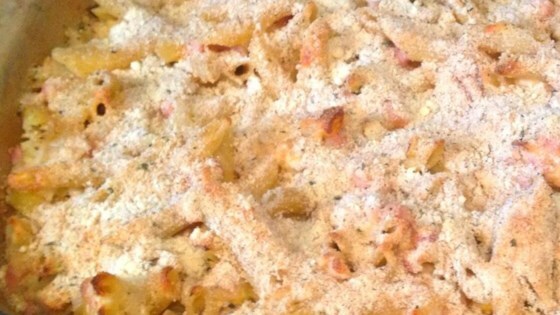 Nice creamy texture with a tasty combination of onion, green pepper, and tomatoes. My family just loves it!" Melt butter in a Dutch oven over medium heat. Cook and stir onion, garlic, and green bell pepper in melted butter until tender, about 5 minutes. Stir cooked macaroni, ham, Monterey Jack cheese, hot pepper Jack cheese, and 2 ounces sharp white Cheddar cheese into onion mixture until well blended. Gently stir milk into mixture until casserole is creamy, adding additional milk if needed. Stir tomato wedges into casserole. Top with 6 ounces sharp white Cheddar cheese. Bake casserole in the preheated oven until cheese is bubbling and browned on top, about 20 minutes. This was served for a bunco group after Easter....it was wonderful! Just the right amount of spice, creamy texture and the green peppers and tomatoes added a fresh element. Not for me. Sauce was not smooth or creamy. This was a nice way to spice up Mac n cheese. Definitely add more cheese. I stirred in the last 6 oz. of cheese before putting in dish, then I added a layer of cheese to top before baking.